The Ghanaian press on Tuesday focuses on the collapse of a power transmission pylon that led to the interruption in power supply to some parts of Accra and Kumasi and the move by the Electoral Commission of Ghana (EC) to enforce the laws governing the operation of political parties. 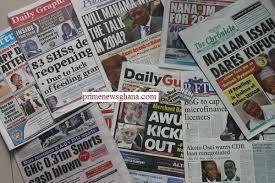 The Ghanaian Times says, "Sabotage... Criminals vandalise Akosompo power plant..Plunge Accra, Tema, Kumasi into darkness." It added that some unidentified people in the early hours of Monday destroyed a 161 kilovolt (kV) power transmission pylon belonging to the Ghana Grid Company, thereby plunging a wide area into darkness. Officials of the GRIDCo said the pylon transmitted power from the Akosombo Hydroelectric power plant, but the unscrupulous people used a hacksaw blade to cut bolts holding the pylon still into its concrete foundation before pushing it down. In the process, the fallen pylon distabilised another pylon just close by while the perpetrators did not take anything away. The Daily Graphic for its part, says the EC has bared its teeth at the various political parties as it moves to enforce laws to ensure that all political parties complied with them. It is therefore focusing on the law that requires all parties to have offices in the various regions and national levels to ensure that the parties have national representation. The Business and Financial Times said the Ghana National Accreditation Board (NAB) has announced it will soon begin ranking the various tertiary institutions in the country. This, according to the NAB, will help enhance the quality of education at the tertiary levels through positive competition.